Scout Digital is a small web and graphic design studio based in Victoria, Australia. When required, we collaborate closely with a select group of experienced, local programming and design professionals. We think that is good too. By working with collaborators on an as-needed basis, we are able to offer you top quality work at a competitive price. 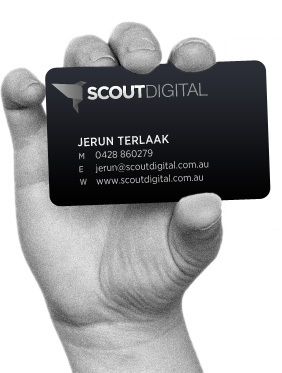 Coming from a marketing background, Jerun Terlaak started Scout Digital in early 2010 after working on many integrated projects at agencies in the UK and Australia. He can also be hired for freelance projects. We're always interested to hear from enthusiastic creatives and business folks who want to collaborate on a project or join forces to make something exciting happen.